2xMC (Universal Music TV, 03/04/2000): 7314 541 551 4 ? 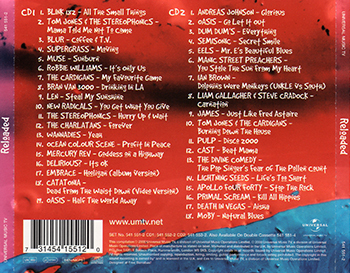 This compilation was issued in April 2000 and features recent hits. Therefore, it’s not very clear why it is entitled Reloaded although it features a couple of songs from Tom Jones’ album Reload. The compilation was available as a double CD set, as well as a double cassettes set. We shall also note that each item has its own catalogue number (CD1 is 541 552-2 and CD2 is 541 553-2). The Divine Comedy track, ‘The Pop Singer’s Fear Of The Pollen Count’, is included on the CD2. We shall also note the CD case features a sticker advertising ‘Half The World Away’ by Oasis as the theme song from The Royle Family. Inside the booklet, there are not particular liner notes, just a detailed tracklisting with copyright information for each song.